Last week, the St. John’s International Women’s Film Festival supported another a six-day long camp to teach budding filmmakers all about the technical and creative aspects of the industry. FRAMED West 2016 kicked off on Monday with Good Grief, lead by mentors Allison White (producer and director) and Peter Buckle (director of photography). Day 1 started with a general meet and greet for everyone involved, background information on the film industry, followed by a table read of the script, and an open discussion each person’s vision for the end result of the short film. Day 2 was an almost overwhelming wealth of information, as we tackled the technical aspect of filmmaking and the gear involved. Learning everything technical about a film set and what’s needed to set up a shoot is a daunting task, and there’s a reason it takes a two-year program at CNA to get through it. C47s, gels, apples, reflectors, grips, dollies, diffusion, f-stop, aperture… and a whole lot more that I’m sure I didn’t catch. Thankfully the instructor and volunteer students who helped us at the campus in Stephenville were very knowledgable and patient teachers. Day 3 marked the beginning of filming. Preparation of the camera gear and other equipment got us up early, but gave us an opportunity to utilize some of the information we had learned the day before. 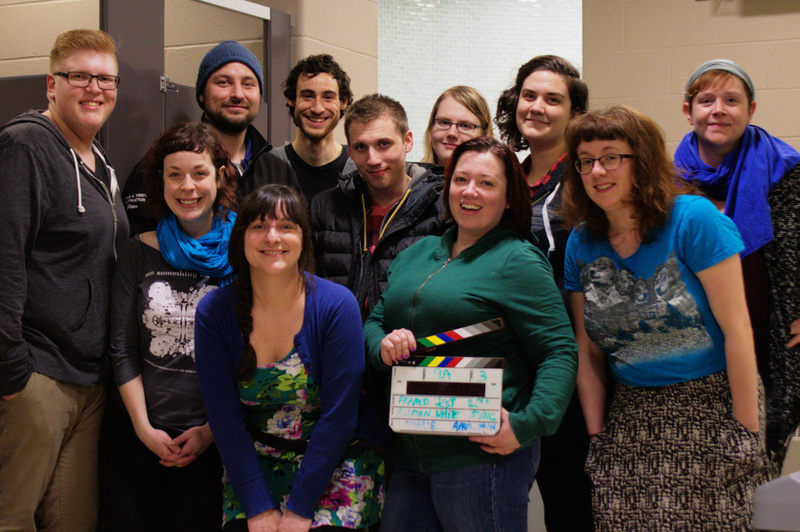 Our film took place in a bathroom, so we didn’t have to do much to create the set. We did, however, have to work in a confined space that wasn’t designed for film equipment. We began to see how everything that we had discussed about our movie on Day 1 was going to fit together, and went over our schedule and logistical plan for the day’s shoots. Next was hair and makeup, which our cast of three mostly handled themselves. Over the next several hours, no one stopped, as everyone had a job to do. There was always a task at hand which meant there was always something new to learn. Each of the five participants had their turn at the various jobs, which included assistant director, cinematographer, camera assistant, and sound mixer, but also included many other responsibilities, like manning the boom mic, setting up lighting, and manning the slate. Day 5 was editing day, which meant still a lot of work, but fortunately most of it was sitting down at a computer. Though only one person can edit at a time, there’s more than enough feedback needed from everyone else involved to make sure that our vision comes across appropriately. Everyone had their say, from what the title would be to what music was used, and everything in between. Fortunately we had Allison, the seasoned professional, to make final judgements and work the editing software to make sure that everything came out looking very professional. And in my opinion, it absolutely did. Which brings us to Day 6… The Premiere. Everyone involved (plus invited guests) met in one of the classrooms Grenfell Campus classrooms to watch the first screening of the film Good Grief, and a series of other short films from SJIWFF’s Films On The Go series. This is my third time participating in FRAMED West, but each year it’s a different experience. All of the people involved make it unique and memorable. It’s not easy to participate in a workshop like this, with a week of long days (which are followed by nights at the office to get work done), but but the wealth of knowledge and experience I receive every time is well worth it. I will forever watch movies differently, and will do so with a keener eye for the details. Knowing what goes on behind the scenes of any industry is a blessing, but getting to experience it all firsthand about the magical film industry is indescribable. Thanks again to everyone involved, and to those who made it possible! It’s because of you that the entire week was an amazing experience. The following is a video that I put together from my Snapchat Stories over the week. It’s not quite the same caliber as our finished short film, but it was a fun little thing to put together.